This collection is perfect for all year on your dining room table, coffee table, dresser, or entry way table. Tasera beige embroidered fabric is 100% polyester which means you can wash it in the washer (in a laundry bag or pillow case), dry it in the dryer, and then little to no ironing is required when you get it out of the dryer. 1. Ideal for cake decorating, bridal, sewing, arts and crafts, floral displays, bouquets, vase decoration, home decoration. 2. 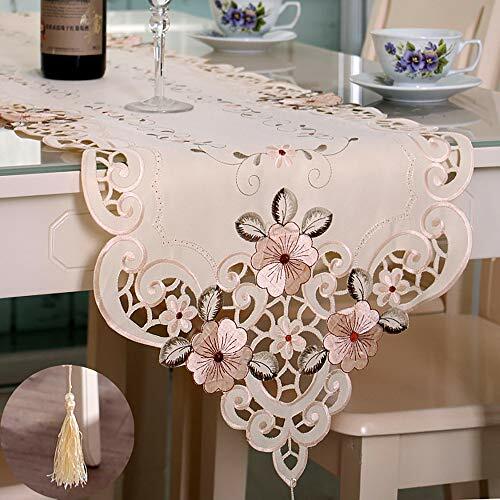 This table runner will add instant beauty to your party or event. 3. Easy to clean, just wipe down with a damp cloth, leave to dry and carefully put away. Due to computer display and shooting light problem, colors may be slight difference please check with us if you have strictly color requirements before you purchase. MATREAIL: 100% brand new and high quality polyester. Complete the look of your tablescape with the beautiful Tasera Table Runner. It features delicate cutwork and beautiful embroidery which makes it perfect for both casual and formal dining. MEASURE SIZE: Measures 15.74” Width x 69.29” Length (40 x 176 cm), size deviation is between 1 to 2 inches. APPLICATION: Soft and smooth fabric, dirt durable, convenient cleaning, suitable dining table, coffee table or cabinet. EASY CARE: machine wash with cold water on gentle cycle & tumble dry low. Do not bleach them or run them through a hot dryer. PACKAGE: Only including the table runner. If you have any question about our product please be free to contact with us, we will reply you within 24 hours.